The woman is looking down contemplatively at the writing box in the lower right corner. We can't be sure, but it looks like there is a little paper weight in the shape of turtle holding down the loose sheets of paper. 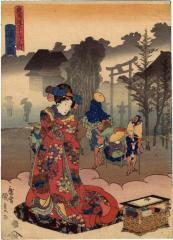 The woman's robe is decorated with numerous flowers, among them irises, and autumn leaves. She is standing on a large, black zabuton, a flat floor cushion used when sitting or kneeling. Illustrated in color in Kunisada's Tōkaidō: Riddles in Japanese Woodblock Prints by Andreas Marks, p. 65, #T24-12. In a description of the original Hiroshige print of this scene in the catalogue of the Michener Collection it says: "A sense of melancholy pervades the a station Mishima in morning mist. The figure of a man on horseback wearing a hat is isolated from his servants and fellow travelers. His bundled manner suggests that he is shivering in the early morning cold. The group, which along with travelers on foot and horse includes one in a palanquin, is passing by the torii gate of Mishima Shrine. The background is silhouetted tones of ai blue and grey. Mishima Shrine was sacred to samurai during the Kamakura period (1185-1333). It was at this shrine that Yoritomo decided on a course of action that would inaugurate a seven-century rule of the shogunate." The 'ōju' (応需) of the signature means 'by request'. Was this a special request by the publisher? Or was it a special request by a patron? We don't know? But what we do know is that it is a series that is out of the ordinary.